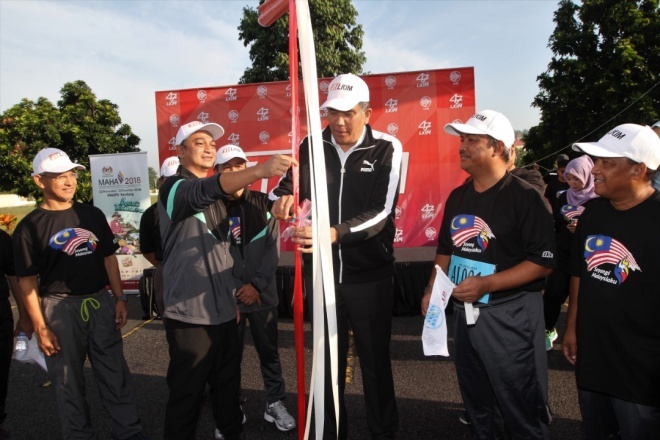 The Chief Secretary of the Ministry of Agriculture and Agro-based Industry, Datuk Mohd Sallehudin Hassan (second left), flagging off the LKIM MAHA Bikers to promote MAHA 2018. 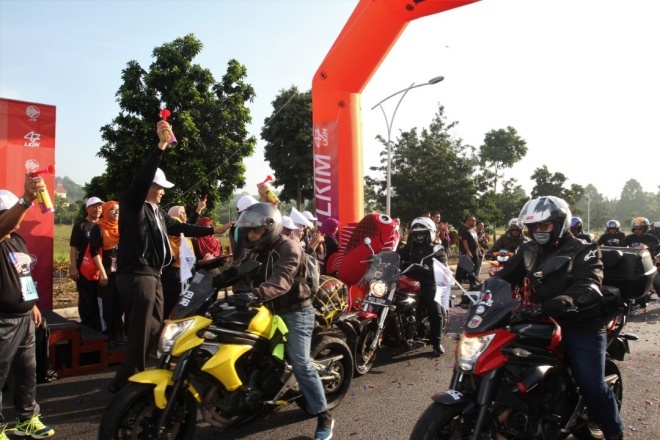 PUCHONG: In conjunction with its 47th anniversary, Lembaga Kemajuan Ikan Malaysia (LKIM) or the Malaysian Fisheries Development Board had organised a motorcycle convoy by LKIM MAHA Bikers 2018 to promote the Malaysian Agriculture, Horticulture and Agro-Tourism (MAHA) Fair 2018 that will begin on 22 November. About 47 riders from the LKIM Motorcycling Club headed by its president went to the Tapah Station to promote MAHA 2018 after the LKIM MAHA Bikers 2018 was flagged off by the Chief Secretary of the Ministry of Agriculture and Agro-based Industry, Datuk Mohd Sallehudin Hassan. At the same time, LKIM also conducted Program FIT LKIM to encourage a healthy lifestyle among LKIM members. 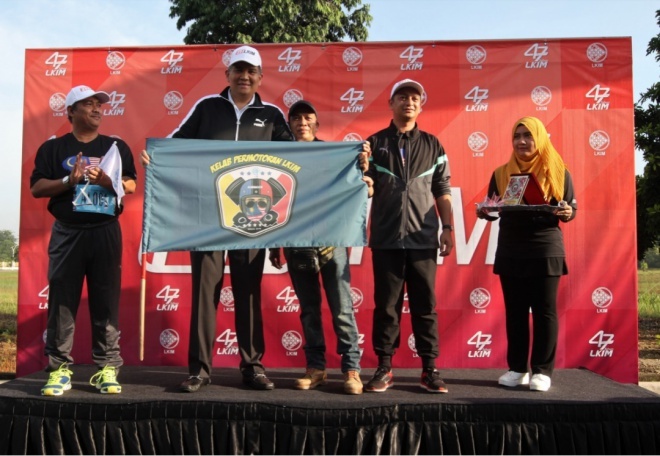 The program that was held at the compound of LKIM’s Main Hall in Puchong, Selangor, also included FIT LKIM Fun Run and various interesting indoor games. The Chief Secretary of the Ministry of Agriculture and Agro-based Industry, Datuk Mohd Sallehudin Hassan, officiating the Program FIT LKIM. LKIM’s staff were also given the opportunity to do health screening that was provided free of charge at LKIM’s Main Hall. At MAHA for this year, LKIM’s ‘Malaysia Seafood Exposition’ (MySE) will be held at Hall A, MAEPS Serdang. LKIM is also presenting the Kingdom Of Seafood and House of Mollusc (HoM) that will be showcasing various forms of clams that are available in this country apart from some species of colourful prawns and octopuses. With the theme ‘Our Food, Our Future’, MAHA 2018 will underscore the importance for the country to defend its food sovereignty as the basis for the country’s strength. MAHA 2018 will also highlight the importance of technology and agricultural innovation (agrotechnology) in the country’s agrofood industry. At MAHA 2018, all the 13 states’ pavilions will showcase the identity, culture, exhibition and food of each state that can be enjoyed by visitors. All the gardens such as Fishery Garden (Laman Perikanan), Pineapple Garden (Laman Nanas), Livestock Garden (Laman Ternakan) and so on will come up with new features so that visitors can experience agriculture for themselves. About 47 riders from LKIM Motorcycling Club headed by its president heading to the Tapah Station to promote MAHA 2018. Program FIT LKIM to encourage a healthy lifestyle among LKIM members.